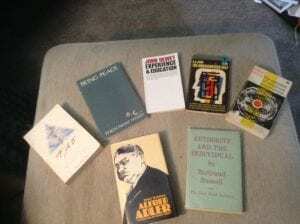 These books are a part of a selection of finds I got from the Prince Rupert Public Library Book Sale this afternoon. The Undiscovered Self, written by CJ Jung, reminded me of my days as an undergrad at the University of Toronto. I was really interested in psychoanalytic theory, and now want to review the ideas again years later. Another book that brings back memories of my reading list was the Varieties of Religious Experience by Williams James. I remember reading that book and discussing it over coffee with classmates and the professor at Trinity College in Toronto. I was intrigued by a book about Alfred Adler’s foundations of individual psychology. During my studies in education, I had always heard about the influence of John Dewey, and cited many of his articles in my essays. So when I found a copy of John Dewey’s Experience and Education, I wanted to get a brush up on his ideas about the needs, problems and possibilities of education. I love the back story of books; the book is old, from a private collection of G. Neil Perry, who turns out to be a Professor at the University of Victoria. Authority and the Individual captures the philosopher Bertrand Russell’s 1948 lecture (the first Reith Lectures) on topics such as social cohesion, the role of individuality, control and initiative, and other topics – topics that are as timely today as they were 70 years ago. Thich Nhat Hanh, a Vietnamese Zen Buddhist monk, gave a series of talks in the mid 1980’s in North America. These talks formed the book, Being Peace, which touches on mindfulness, meditation, and Zen principles. Another book that caught my eye was 365 Tao, a series of written daily meditations using Taoist principles. Be the first to comment on "Library Book Sale – My Picks"